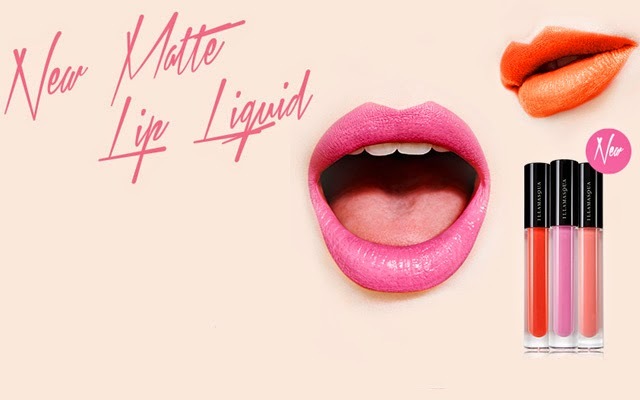 After 3 years of development Clinique have produced their newest line up of matte lipsticks. Eight shades are available and all of the colours have intense, full bodied vibrant pigments. Unlike a lot of matte textured lipsticks these feel moisturising, cushioned and soft on the lips. Even though I always have dry lips these still glide over the skin and didn't even cling. These lipsticks have undergone some serious staying power tests and even when they do start to fade slightly they are still even rather than patchy. We adore the creamy texture of them. Made with a beeswax base to moisturise these also contain porous silica beads to prevent product breakdown and keep the lipstick looking fresh on your lips. Kind of how those little bags of silica you find in your new shoe box work! and are in stores nationwide from 6th June 2014. YSL's summer collection is available now and with a typical colour palette you would expect for the summer months. The pieces from the launch we are most excited about are the Baby doll kiss and blush. A dual purpose cheek and lip cream. Containing an air whipped formula this gives a matte finish rather than a gloss finish with an almost gel like texture as you apply it. We found it sat better on the cheeks than it did the lips. On the cheeks it gives a matte stain finish that has a transparency to it and on the lips it gives a sheer matte wash. The colours are beautiful however if you have a dry lip this does cling in all the wrong places. Giver your lips a good exfoliation before application. The bottle is a nail polish style and the wand is leaf shaped applicator with a flexible bead in the centre. We are not sure the flexible bead makes application any easier but the wand allows a small amount of colour to be added without over loading the cheek/lip. These smell phenomenal also. There are 12 colours in total which are £27.00 each. The eyeshadow palette in the collection is not for the natural colour lovers. It holds a selection of 5 shades each with a high shimmer finish. A mix of coral and blues housed in a mirrored compact with two application tools. You can create many different looks with these shades. A soft coral eye which will make blue eyes pop or a smoky sultry midnight blue eye. Alternatively use the vibrant blues as a liner colour along the lower or upper lash line as a liner. Let us know how you would wear it. There are 2 shades of nail polish in the collection. One in a turquoise and one in a deep metallic blue. We tested the blue which was stunning. Gorgeous deep blue with a high shine. The nail polishes are £18.50 each. As always, two coats are needed for full impact. Shocking I know but it's raining here in the UK today. Actually teeming down with rain! This has got us thinking about waterproof makeup. There has always been waterproof mascara and eyeliner knocking about but more and more recently we have seen waterproof makeup for other areas of the face. When on holiday we personally prefer to wear little or no makeup but not everyone feels this way. We get lots of emails form ladies and gents who are going on their holidays or who are wanting to go swimming but are conscious that they don't want their foundation or brows to come off in the water. Also if you live in a humid country these would benefit. These water resistant blushers come in three different shades and are presented in a metal 11g tin. The tin packaging is good to keep the water out if you are wanting to take this pool side however not so great in the sun as the metal heats up. We tested two of the colours in Los Cabos and Ibiza. Both colours are powder texture with a fine shimmer fleck. The colour payoff is really good and can be built to be super strong. The shimmer can be quite intense once it is built up and would be very shimmery/frosted on a darker skin so take it easy with building colour. Los Cabos is a warm coral which has a red base to it. The shimmer fleck is a rose gold. Really beautiful tone on a sun kissed skin. Ibiza is a blue toned baby ice pink with a silver shimmer fleck running through it. The silver shimmer in this would be quite apparent on a darker skin tone but would look beautiful on a fair skin. These blushers are £24.00 each. We also tested the bronzer in the range. Same great payoff as the blusher but in our opinion way to shimmery to be used all over the face as a bronzer. Pretty much a metallic bronze/gold finish. Very lightly dusted over the high points of the face it would give a pretty gold radiance and would look gorgeous as a highlighter on a darker skin. The bronzer is £24.00. So how do they perform under water? The pigments in these are coated with silicone to make them sweat and water resistant. We found when held under water they didn't move. When out of the water they still looked the same. You just need to ensure you don't rub it whilst it is still wet. If you rub it before it has dried off it will move slightly. If I could swear about the staying power of these on here I would....these are ******* amazing!! Coming in two colours of soft gold (No26) and warm, bronze brown (No25). They are twist up cream eye shadows which glide onto the skin easily with no drag. As you may expect you need to work quick with these. Apply and blend immediately. Once dry my goodness these are incredible. You could kayak over Niagara Falls in these and they wouldn't budge. The gold has a high reflective finish and the brown has a beautiful bronze fleck of shimmer through it. These have an ingredient in them called Ozokerite which is a mineral, paraffin wax. The water literally just runs off of it. To get these off use a really oily eye makeup remover. Hold a saturated cotton pad onto the eye and let the oil soak into the product for a few seconds before wiping the product off. Be careful not to drag your delicate eye area. Diego Dalla Palma also do a semi permanent mascara. This contains a silicone resin which again coats the lashes making the colour resistant to sweat, tears and water. This mascara is designed to stay on until you remove it...and it works! This comes in black but we love that it comes in a dark brown. So many brides ask us for a tear proof mascara in brown for their wedding day and it's getting harder and harder to find a brand which does brown waterproof. Look no further this answers all your prayers. We also love the brush. It's a bristly brush which is not too chunky. Take this off with an oil based remover. The common ingredient with waterproof products is silicone. Not every product containing this will be waterproof but it will certainly help to make the product water resistant. When choosing your foundation and lipstick with swimming and holidays in mind check for the silicone ingredient being high up on the ingredients listing. Let us know if you have had any amazing products which have lasted in humidity and water. We were sent these patches from Realline Beauty last week to see if we can alleviate our ever increasing frown lines. The patches have no ingredients as such in them, they are basically a diamond shaped polyethylene film which has an adhesive on one side of it. The adhesive is rubber and latex free incase of allergies. There are 30 patches in each box with two per sheet as seen above. To apply make sure the skin underneath is clean and dry. If you have applied your moisturiser wait a few minutes until it has absorbed in. With two fingers spread the skin on the forehead so that the skin is taut. With the other hand apply the patch by pushing it onto the center and then smooth down each side. Release your other hand and smooth over the patch. The patch basically holds this taught skin position. It means that you can't frown or wrinkle up your forehead. Does feel slightly weird (but not uncomfortable) and you do look a bit strange!! You need to keep this patch on for several hours so best to apply before bed time. Now this obviously isn't a miracle worker and is totally a temporary solution. I do tend to wake up with red frown marks on my forehead so what this patch does is prevents you from frowning in your sleep. By wearing the patch you are basically giving your muscles in this area the night off allowing them to relax. This is why the number 11 in between your eyes looks smoother upon wakening. The next morning when I peeled it off the skin did definitely look smoother and although the fine frown lines I have are still there they do appear softer. By the end of the day the old lines I know are starting to appear slightly pink again through my endless frowning. Obviously they would do though. The patches do work albeit it temporary. These would be great to use for a few nights before your wedding or other important event. I guess if you were totally bothered by brow frowning you could wear these every night if you wanted to! The picture below is after one nights use before and after with no foundation on. I know the lighting is slightly different on the bottom picture but it was a nigh time in the first picture and morning in the next!I found that after removing the patch my skin did appear shinier, I guess maybe the skin sweats a little more underneath. If you have blemishes in this area I wouldn't recommend using the patch as when you peel it off it does pull the skin slightly and may pull at any healing areas of the skin. Have you tried these? We would love to hear your results. I saw this picture on twitter ages ago that someone had posted and it made me chuckle. We have all tried to do a beautiful feline flick only for it to go totally wrong!! 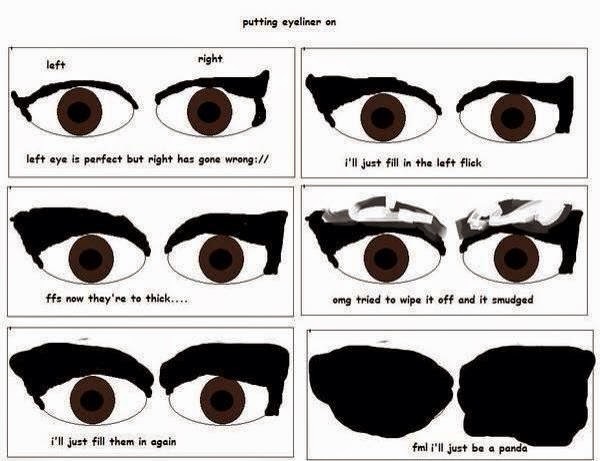 It's the question we get asked over and over again " what's the best way to apply liquid eye liner to get it even". Sorry there is no magic answer. Everybody has different techniques but when it comes down to it, it's just practise, practise, practise. It's always exciting to see new liner products which attempt to make the job easier. 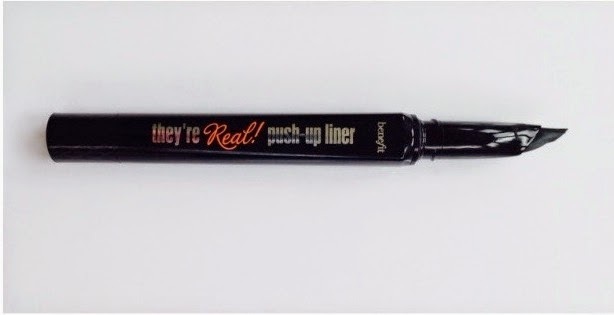 Benefit have come up with their new gel, liner pen called They're Real Push Up Liner. Rather than the normal wet liquid style liner this is a gel liner which makes it easier to control. Twist the end to dispense the gel out of the angled tip. The tip is a slightly flexible, sharply angled tip almost like a shark fin. The very tip of the fin (this is what I'll call it!) is so fine that it allows you to create a fine end to your flick. The cap to the liner is screw on rather than push on. I like this because it means you actually put the lid back on correctly and it won't knock off in your makeup bag and dry out. The texture of the gel is quite dry which means you can control where you apply better and if you blink it won't transfer. The fine angled tip also allows you to tight line the eye easily and get right into the inner corner of the lash line too. The colour is jet black and one application gives a good cover, you won't need to keep re-applying. The gel is waterproof so you will need to use waterproof eye makeup remover or Benefit also now do a They're Real remover. This can be used on the They're real mascara also. As part of their new summer collection called Matte Effect Illamasqua have launched their new matte liquid lip glosses. The texture is thick so apply a small amount and build. This dries pretty quick and once dried off it is totally matte. The colour pigment in these is insane so if you want a vibrant matte lip then head over to Illamasqua. The texture still feels comfortable although if you are used to a glossy finish it is going to take a bit of getting used to. Staying power is fab. These don't bleed out, feather or transfer. I would use a lip liner with it just to give a crisp edge. Illamasqua are also currently running an online selfie competition where you could win the entire collection from the Matte Effects summer launch. 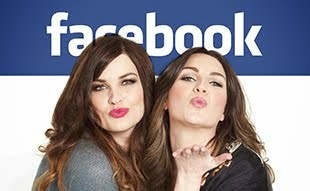 All you have to do to enter is take a selfie of you and your best friend who is also crazy about lip gloss. Post your picture on Instagram, Twitter or Facebook using #illamasqua and #LipGloss and tag Illamasqua and your friends name in it too. They will then pick their favourite entries from that week. You must be following Illamasqua on the chosen platform of entry. You can enter more than once and with a different person in different pictures if desired. This competition runs until 3rd June 2014. Good luck! This product is much more moisturiser than it is tint. The 50ml tube dispenses a lightweight lotion textured moisturiser which is very softly tinted. Clarins state this is for all skin types but having used it on both a combination and a dry skin it definitely performed better on the dryer. It contains hyluronic acid which is a huge moisture magnet. It helps skin maintain it's moisture levels which in turn gives skin a more plumped texture. The hyaluronic acid also helps with skin healing so great if you suffer flaky, scarred or acneic skin. Another interesting ingredient it has is Katafray bark extract. This is obtained through fair trade and is sourced in Madagascar. This also helps reinforce the moisture barrier in the skin. When blended with hyaluronic acid it is said to sense the climate you are in and help skin to adjust to the temperature. This is also SPF15 to protect in the sun although you will still need to wear sun screen in hot temperatures. The tint in it is exactly that.. a tint. This product will not give you a coverage as such but naturally even out your skin tone. You can of course use a separate concealer on top if you feel like you need a little more cover. It contains radiance boosting pearls which capture light and give a glowing radiant finish. Beautiful on a dry skin, slightly to sheer and shiny on a combination/oily skin we felt. There are seven colours in all and we tested four of those available. The colours are all very peach toned. The peach pigment is great for reviving a dull complexion however it can make choosing the colour difficult. They are of course very sheer so if you made a wrong colour choice it wouldn't be too hard to make it work for you. Because of the warm peach undertones we would say opt for the slightly lighter colour than you think you will be. It will be much easyier to darken up with bronzer than tone down. A lovely product for the beach if you want just a little bit of help without the foundation look and feel. Just don't forget your sunscreen underneath. This palette has been out for a couple of weeks now but we have only just got our hands on it. A dream product for lovers of the tanned or contoured look. In a summer patterned, metal pencil tin style palette comes three different bronzing products along with an application brush and mirror. The first bronzer is called chocolate soleil and is a totally matte bronzer. Guess what..it's also infused with the same delicious cocoa scent as the chocolate palette we spoke about a few weeks back. This bronzer is a golden toned powder which goes on quite sheer enabling you to build colour without over doing it. A great colour to contour an already slightly tanned skin. In the middle is Sun Bunny, natural bronzer. A duo bronzer featuring an apricot and slightly more golden bronzer. Nothing really too natural about these colours really. Both colours are frosted so have a high metallic finish. This would be a beautiful highlighter on an olive or darker skin tone. We personally think it might look a little too shimmery as a bronzer all over the face. The third colour is Snow Bunny luminous bronzer. A blend of four highlighting colours again with a frosted finish. Top shade is a lovely buttermilk, golden highlighter and the second colour down is a soft rust/gold. The third and fourth colours are pink toned highlighters but no matter how hard I swiped my finger across them I just couldn't get much colour. Shame because the colour pay off in all the other shades is really good. The brush is a cruelty free flat kabuki style brush. This picks up a small amount of colour and because of it's slimmer style it is a good tool to use for contouring. A dual ended brush probably would have been a good idea so you can use one end to bronze and one to highlight with. There is also a contouring and highlighting guide in the box to give you some tips on where to apply each product. Yet another gorgeous palette from Laura Mercier. This artist's palette for the eyes is limited edition and available only from John Lewis. Twelve powder shades are in cased in a chic leather compact. The exterior of the compact is in an animal print style which seals shut by a magnetic strip. Inside is a large mirror. The shades are split between matte and shimmer. The top row of matte shades are the perfect colours to create depth through the socket line. Even a more natural smokey eye can be created with the flesh tone contour colours in cafe au lait and ginger. The bottom row of shimmer colours tend to be more mink/plum colours. Colour payoff is of a really good quality and these colours blend well without dropping. In the palette there a few limited edition colours in Diamond Pink and Violet Steel. Also with this palette you would receive a mini caviar stick in the colour cocoa. The caviar stick is a twist up cream eyeshadow with intense colour. This colour is a chocolate brown with the tiniest gold fleck shot through it. Scribble this all over the movable part of the lid and buff in to the shape you require. Any of the powder colours you then put on top will grip the cream, become more vibrant and wear time will be increased. The caviar stick is the perfect product to use to create a really smudgy, sultry eye. A mini full blown volume lash building mascara in black is also included. The teeth on the brush are well spaces to create definition. The palette, caviar stick and mascara are £60.00 and are available this May from John Lewis only.